BELIZE CITY, Mon. Apr. 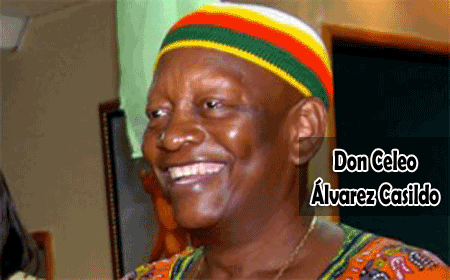 11, 2016–Afro-descendants of Central America, and especially the Garifuna community, are mourning the loss of Don Celeo Álvarez Casildo, who became known to us at Kremandala for his leadership role in the Central American Black Organization (CABO), based in his home country, Honduras, as well as his founding role in the Organization for Ethnic Community Development (ODECO), which helped to establish CABO in the 1990s. Amandala received news today that Álvarez, 57, who had been diagnosed with throat cancer, passed away at 10:45 this morning at a hospital in Tegucigalpa. Over the weekend, doctors had taken a decision to end his treatment. Sources close to Álvarez said that he had been seeking cancer treatment both at home and in Cuba, and he had also undergone two surgeries to fight his condition. Teofilo Colon, Jr., who runs an online site dedicated to the Garifuna cause, beinggarifuna.com, said Álvarez is noted for his championing of the rights of Afro-Descendants in Latin America. “Celeo made a living shining shoes in Central Park. He eventually earned a degree in Economics and while working in the Honduran healthcare industry, became the first black president of the Hospital Workers Union, where he impacted the lives of many as a labor organizer. After retiring from being a labor organizer, he then began to focus on attacking the marginalization of Blacks and indigenous people in Honduras that he witnessed growing up,” Colon’s site documents. Álvarez’s activism spanned more than two decades and he was nominated for the Nobel Peace Prize in 2008. “For the good that he did for CABO, we give thanks and praises,” YaYa Marin-Coleman, CABO’s Secretary of Communications, said, still shocked by the news of his death. “We need to really appreciate people when we are with them. We don’t know when we will see them again… He will be missed by many people,” Marin-Coleman said, adding that Celeo’s death should signal for CABO the need for unity of African people. “Wamuisaruña lárigi láguyu wawügüri Sásamu Celeo Álvarez Casildo. Tügüla lidasin lidan ibagari le, lanügali lubéi ti lubara haganagua Háhari Wayunagu,” said E. Roy Cayetano. Álvarez is scheduled to be laid to rest this Thursday in La Ceiba, Honduras.